NEW YORK - There's Black Friday, then there's Target Tuesday. In a scene that was reminiscent of the shopping frenzy that typically comes on the day after Thanksgiving, Target's website crashed several times throughout the day, and more than a hundred shoppers lined up at many of its stores early in the morning on Tuesday for a sale of limited offerings of its Missoni for Target collection of bikes, luggage, clothes and housewares. The 400-piece line made by the Italian luxury knitwear designer Missoni exclusively for the cheap chic retailer features its trademark zigzag patterns for between $2.99 for stationary and $599.99 for patio furniture -- a fraction of the price of the designer's real duds that can go for $595 to $1,500. "This was Missoni mayhem," said Joshua Thomas, a Target spokesman. "This is unprecedented." 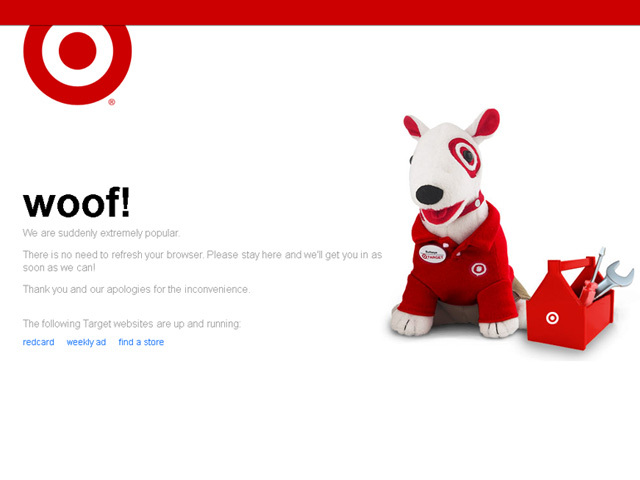 Target's website was briefly back online early Wednesday, but then went down again and was still down as of 6:30 a.m. EDT. By 8:30 a.m., it was back up, and Target had issued an apology to its customers. So-called limited partnerships, in which high-end designers create cheaper versions of their fashions for lower-end stores, have become popular in recent years because they appeal to cost-conscious customers who want to be stylish but aren't willing to pay designer prices. At a time when Americans are watching every dollar they spend, the limited-time offerings also are part of a growing strategy by retailers to spur impulse buys by creating a sense of urgency for shoppers to buy. Swedish retailer H&M, which caters to 20- and 30-somethings with trendy clothes, often attracts long lines at its stores that reach around the block when it offers limited-run affordable fashions from upscale designers like Jimmy Choo. It also will be launching a less expensive version of the Italian designer Versace's collection in November. Target, in particular, has become known for creating buzz around its limited partnerships with designers and fashion brands, including its latest partnership with Liberty of London last year. Target offered 300 items with the designer, which is known for its floral prints, and sold out of most of the merchandise in a couple of days. Likewise, Target Corp., based in Minneapolis, worked hard to create buzz around the Missoni by Target collection. Target declined to comment on how much the company spent on marketing, but it targeted social media sites like Twitter and had ads on TV and in Vogue magazine. Ahead of the launch, Target also opened a temporary store in Manhattan at the start of New York Fashion Week last Thursday. But the colorful shop, which spanned six city blocks, was supposed to stay open for three days, but winded up closing after six hours because items sold out. Online, shoppers rushed to the site for the 6 a.m. launch. But soon after, online consumes came face-to- face with its mascot bulldog along with the disappointing news: "Woof! We are suddenly extremely popular. You may not be able to access our site momentarily due to unusually high traffic. Please stay here and we'll try to get you in as soon as we can!" Even celebrities were tweeting about the launch. Actress Busy Phillips, who plays Laura in ABC's "Cougar Town," tweeted: "Got the bike. Not the colorful one but still SO EXCITED." Target had planned to continue selling the line into October at all 1,700 stores around the country. But shoppers will be lucky if they can find something they want. In fact, based on a spot check by Target of stores in Minneapolis area, everything had sold out by Tuesday morning. Target is replenishing some merchandise over the next few days, but it will trickle in. Some shoppers already are trying to capitalize on the fleeting nature of the Target's Missoni collection. As of Tuesday afternoon, there were 1,591 listings for Missoni for Target on eBay.com that were selling for more than double the price found at the discounter. Travel totes were going for $169, while shoes were selling for $129.99.